Seat Riser for the 1928-29 Closed Cab pickup. This is the metal risre that goes between the seat springs and the floor. Pick-up truck Door hinges 1928-29. Cast bronze door hinge for the 1928-29 closed cab truck. Hinge pin hole is drilled and pin is installed. You will have to drill/tap mounting holes and cut to length. Long enough to work on top, middle or bottom. Made in USA. This is the 4-hole mount male dovetail. Chrome plated. For the 1928-29 Closed Cab Trucks. This is the female dovetail for the 1928-29 Closed Cab Trucks. They have the rubber already installed in them. Truck hinge screws Hinge to Door 1928-29. These screw kits are only for the 1928-29 Closed Cab Trucks. Each kit contains enough screws for one door. Truck hinge screws Hinge to Post 1928-29. These screw kits are only for the 1928-29 Closed Cab Trucks. Each kit contains enough screws for one door. Door Lever Anti-Rattler for the Model A truck. A carry over from the 1922-27 model T closed cars, these are used on some of the model A Trucks with the slide type door openers. Made in USA. 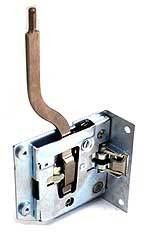 A two piece door striker assembly for the 28-29 Closed Cab Trucks. A set is for 1 door. Door Bumper Holder. This stamped steel part holds the door bumper in place on the 28-9 Closed Cab Trucks. Seat Backrest Hook 1928-34. This is a hook that holds the bottom of the seat back to the wood frame. Need 2. Made in USA. Window Frame 1928-29 Left. The frame for the door on the 28-9 Closed Cab Trucks. This is the upper frame only. Made in USA. Window Frame 1928-29 Right. The frame for the door on the 28-9 Closed Cab Trucks. This is the upper frame only. Made in USA. 1928-29 Pickup Door Frame Screw Set. Set consists of of six 10/32 x 3/8 round head and three 10/32 x 3/8 oval head screws. Enough for one window frame. Window Frame Brackets for the front of Door. Screw these metal strips onto the vertical portion of the window opening for the window frames to slide down on. These are included with the new frames A-80301-L or A-80301-R. For the '28-'29 Closed Cab Pickup and Panel Trucks. Made in USA. Window Frame Brackets for the rear of door. Screw these metal strips onto the vertical portion of the window opening for the window frames to slide down on. 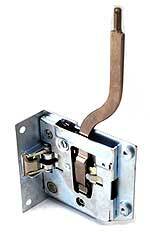 These are included with the new frames A-80301-L or A-80301-R. For the '28-'29 Closed Cab Pickup and Panel Trucks. Made in USA. 30-31 Pickup Seat Clips . Holds the backrest spring in position. Several different sytles have ben found. This type mounts to the face of the belt rail wood. Made in USA. 30-31 Pickup Seat Clips . Holds the backrest spring in position. Several different sytles have ben found. This type had the 4 top clips spot welded to the back of the cab under the belt rail wood. Made in USA. Striker Shield 1928-29. Used on the 1928-29 Pickups. Mounts inside the striker area to help hold weather strip. Made in USA. Door Plug 1928-29. Ever wonder what the hole was for above the outside door handle? This little rubber plug fits in the hole. Made in USA.